1. after receiving the product, please remove the battery, reinstall, and according to the instructions of the computer configuration. 2: sensor and computer can not exceed the distance between 60cm, the distance between sensor and magnet can not exceed 0.5cm. please see the instructions for details. 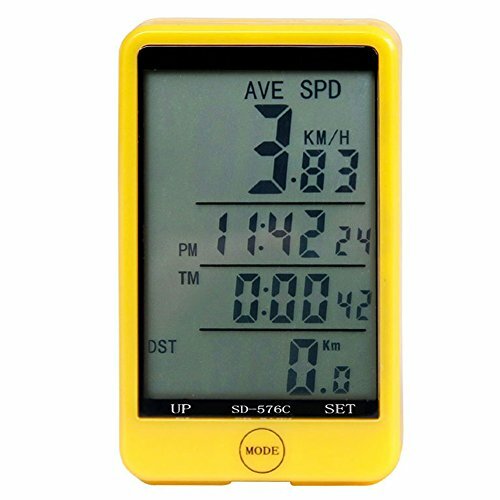 Multi-functional to meet your different riding needs: such as real time, distance, speed comparing, average, maximum, relative, riding time, riding distance, temperature, stopwatch, etc. More convenient and durable, it can be easily mounted on any direction, horizontal or vertical, suitable for bike, mountain bike, road bike, etc. No need to worry about rain again, but avoid it exposed long time in the rain and water as it may absorb through. Besides, in case the device will not working very well because of water, remove the battery and let it dry. The odometer with cycling computer with green back light allows you to read the data clearly in the deep dark night or in the long tunnel. Easy-to-read large LCD screen display, you could enjoy the digital easily and remotely.